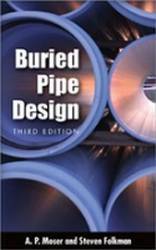 This brand-new edition of Buried Pipe Design helps you analyze the performance of a wide range of pipes, so you can determine the proper pipe and installation system for the job. Covering almost every type of rigid and flexible pipe, this unique reference identifies and describes factors involved in working with sewer and drain lines, water and gas mains, subway tunnels, culverts, oil and coals slurry lines, and telephone and electrical conduits. It provides clear examples for designing new municipal drinking and wastewater systems or rehabilitating existing ones that will last for many years on end. Comprehensive in scope and meticulously detailed in content, this is the pipe design book you'll want for a reference. This NEW edition includes: Important data on the newest pipe styles, including profile-wall polyethylene, Updated references to ASTM, AWWA, and ASHTTO, standards, Numerous examples of specific types of pipe system designs, Safety precautions included in installation specifications, Greater elaboration on trenchless technology methods, New information on the cyclic life of PVC pressure pipe.